Audio-Technica’s stringent quality and consistency standards set the AT2020 apart from other mics in its class. Its low-mass diaphragm is custom-engineered for extended frequency response and superior transient response. With rugged construction for durable performance, the microphone offers a wide dynamic range and handles high SPLs with ease. The price/performance standard in side-address studio condenser microphone technology. High SPL handling and wide dynamic range provide unmatched versatility. Custom-engineered low-mass diaphragm provides extended frequency response and superior transient response. 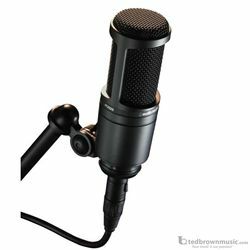 Pivoting, threaded stand mount attaches securely for easy and precise placement of the microphone.